The processing takes place in a new industrial premise especially designed for food processing. We have made sure the facilities meet the highest standard which guarantees the best processing of our raw material from the time we receive it until the product is finished and packaged for the consumer market. 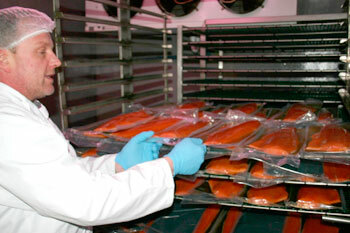 The Reykhólar smoke house buys only the freshest and best raw material available. That´s why our employees make sure hygiene is of the utmost importance during each stage of the processing.